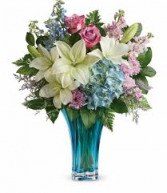 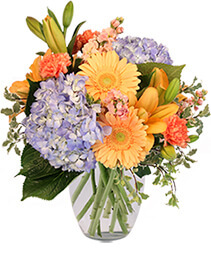 An arrangement of Roses, hydrangea, asiatic lilies, delphinium, stock, chrysanthemums, and limonium designed in a hand blown vase of aqua blue. 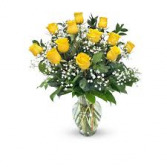 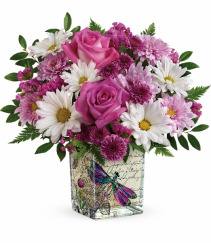 An arrangement of roses, button spray chrysanthemums, daisies, and statice designed in a glass collectable cube finished with a decal of a Hummingbird in flight. 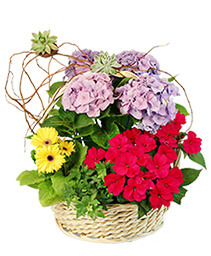 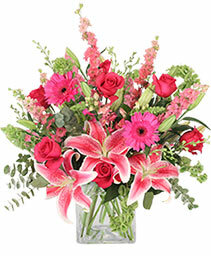 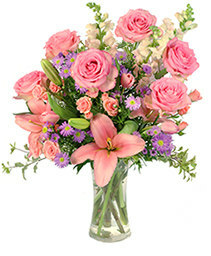 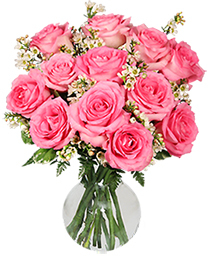 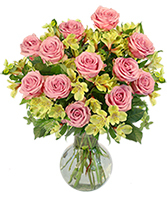 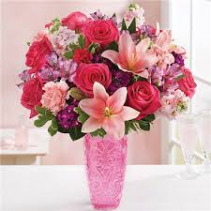 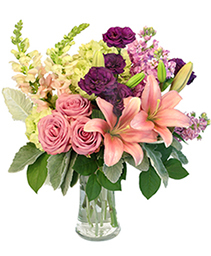 An arrangement of Hot Pink Roses, Pink Asiaic Lilies, Pink Snapdragons, Purple Carnations, Pink Carnations, Purple Alstromeria,Hot Pink Mini Carnations designed in a pink European Glass Vase. An arrangement of pastel roses, spray roses, alstromeria, stock, cushion spray chrysanthemums and statice designed in a hand-glazed ceramic vase with a decorative ceramic medallion of a hummingbird dangling from a twine cord. 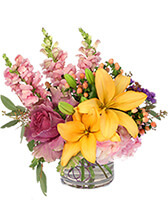 80.00 arrangement can be designed using lilies with the previous recipe. 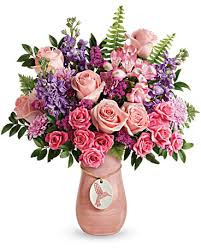 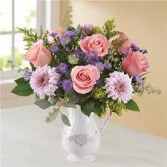 An arrangement of pink roses, lavender fuji mums, solidago, purple monte casino, and seeded eucalyptus designed in an elegant collectable Southern Living Charlotte Pitcher. 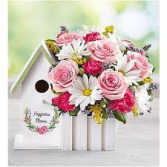 An arrangement of white daisies, pink roses, hot pink mini carnations, solidago, purple limonium designed in a Wooden Birdhouse Planter. 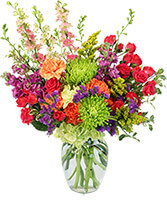 A delightful arrangement of colorful roses, spray roses, alstromeria, carnations, and mini carnations designed in hand-glazed, crackle-finish stoneware crock with etched details. 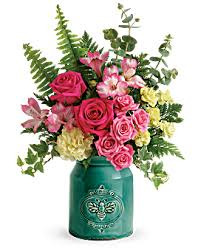 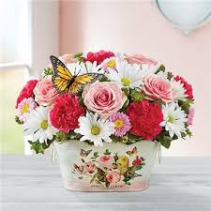 An arangement of white daisies, pink roses,hot pink carnations, pink matsumoto asters, and varigated pittsoporum accented with a butterfly, designed in a metal collectable container. 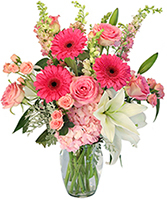 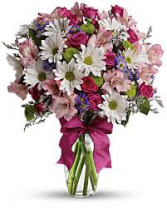 An arrangement of white daisies, pink alstromeria, green button poms, hot pink roses, purple monte casino, limonium and greenery in a clear glass vase accented with a dark pink ribbon. 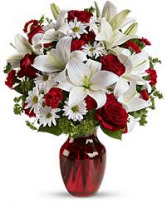 An Arrangement of white lilies, red roses, white daisies, red mini carnations and mixed greenery designed in a red glass vase. 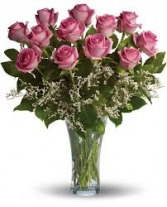 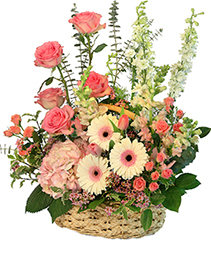 An arrangment of white daisies, and pink roses and greenery designed in a clear glass cube.